Is there anything more classic in the fall than a slice of apple pie? This easy apple pie recipe will have you enjoying a big wedge of irresistible apple pie without any extra hassle or effort do so. While rustic apple pie recipes like an apple galette are useful when you’re short on time (or baking skills), sometimes you just want to make something completely nostalgic and classic, especially for the fall holidays. This easy homemade apple pie comes together quickly and doesn’t require any special skills on your part. You can use a store-bought pie crust, or make your own crust if you want to adhere to any special dietary needs. 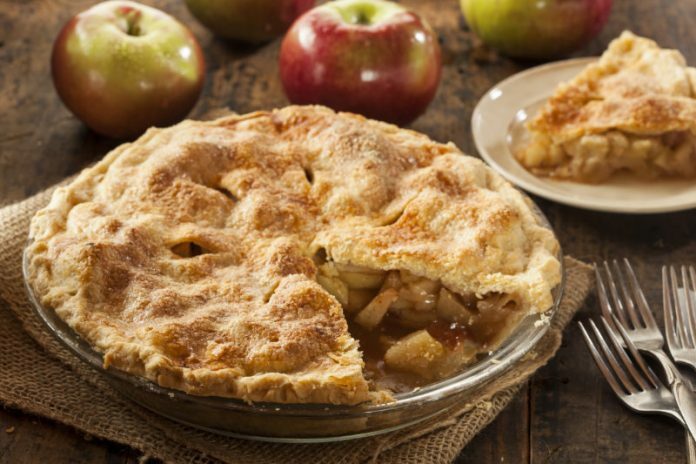 This easy apple pie recipe is made with fresh apples, some sugar, spices, and flour. The flour helps thicken up the filling and will help you create neater slices when you’re cutting into your cooled apple pie. You can use any variety of spices you like but we recommend cinnamon be one of them. Once you’ve added some cinnamon, you can add more spices like nutmeg and cloves, or just keep it simple with the cinnamon. You can even add a touch of orange zest for extra vibrancy and fragrance. If you use pre-rolled pie crust sheets, then this easy apple pie recipe comes together in 20 minutes. After that, it’s baked for 45 minutes then cooled to room temperature. Preheat the oven to 425°F. Grease a 9-inch pie pan with cooking spray. Place one pre-rolled sheet of pie dough into the pie dish, molding the dough against the bottom and sides of the pan. In a large bowl, toss the apples with the brown sugar, cinnamon, and flour until combined. Pour the apple filling into your prepared pie pan. Place the second sheet of pie dough on top of the filling, using your fingers to pinch the edges of this sheet to the bottom pie dough sheet that's lining the pan. This will help seal the pie closed along the edges. Use a sharp knife to make a few slits in the top of the pie dough to create vents for steam to escape. Bake the pie for 15 minutes, then reduce the temperature to 375°F and bake the pie for another 30 minutes or until the crust is golden brown. Let the apple pie cool on the counter to room temperature before serving - about 2 hours.